My greatest inspiration to become an excellent teacher originates from a widening participation program where I found the tutor to be engaging, direct and humourous. I have always remembered how this straight-forward approach made the subject more accessible and enjoyable so I made it my aim to do likewise. Less can be more! Not everything you are passionate about can be covered in a seminar so choose your content wisely. Help every student find their voice by creating an environment aimed at building their confidence in class. Create a varied program of ideas and group discussions that fosters a greater keenness to participate and communicate. Research-led teaching is great but inquiry-led learning challenges their thinking and encourages deeper subject penetration because students understand and think more profoundly about what they have discovered for themselves. Moodle isn’t as scary as I thought! However, I personally prefer face-to-face teaching supported by informative PowerPoint presentations. What does being highly commended in the WATE awards mean to you? Winning the PGR category in WATE 2015 and a commendation in WATE 2017 provided both the recognition of my skills as a teacher and a stimulus for me to strive to develop my methodologies to enhance further my students' learning experience. The award has opened up opportunities to participate in wider initiatives to facilitate student learning where I have been able to offer guidance, help and support by sharing my teaching concepts and creative practices. Seeing students have that ‘light-bulb moment’ when they grasp what was previously considered difficult to understand. Having high levels of attendance and engagement because students want to be there and want to contribute even if class is at 9am! Hearing students wish a seminar could have been longer and knowing you have inspired them to strive to fulfil their own best potential. Seeing how by spending time for guidance and feedback on an individual basis pays enormous dividends. Students at an early stage in their academic career can find answering questions an intimidating challenge. I overcome this by setting a theme at the end of each week where every student is asked to bring a contribution to the next seminar, and each presents their findings to their peers. In order to encourage students to seek out material for themselves and make their own discoveries, I additionally create six or seven salient research foci designed to challenge their thinking and encourage deeper subject penetration; these are disclosed at the end of each session in preparation for the following seminar, and each student is allocated a particular task. This means that all students come to realise that questions will need to be answered by everyone, not just a select few. Consequently they stay alert and engaged in anticipation of my directed question and this fosters better participation and interaction as well as a more lively exchange and evaluation of ideas. I have learned that it is important to listen and learn also. I regularly request suggestions and feedback so that I can adapt my teaching methods accordingly. Students’ active involvement in enhancing and designing the content means that the learning experience is infused with new dynamic ideas and viewpoints which can build on and enrich the seminar’s central core material. As the term progresses, students become increasingly proud of, and excited by, their research findings and this high level of interaction encourages even the most timid to become more confident in class debates. 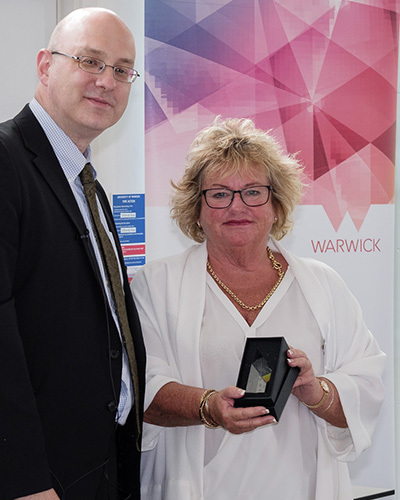 Be determined to truly make a positive contribution to the student learning experience at Warwick. See teaching as more a privilege than a job. Nurture a consummate love and comprehensive knowledge of your discipline. Use imagination at the planning stage because appropriate and effective lecturing logically flows from good preparation and confidence in your knowledge of your subject. Show enthusiasm and stimulate excitement for the subject. Impart information that goes to the heart of the matter and to do so with energy, confidence and positivity. Ensure material presented in lectures is meaningful and correlates directly with the ground covered in seminars. Convey desired learning outcomes with clarity and infectious enthusiasm so that every student in that room wants to sit up and take notice. Achieve a dynamic presence by working from prompts rather than a written text and by engaging directly with the students in the room. They should leave feeling invigorated by the information imparted and that can only be achieved by bringing life to the lectures and by making it relevant. Apply a research-based dimension which enhances their reading of the essential literature and cultivates a growing passion for understanding not just reading about the topic. Take time to give constructive feedback and guidance on an individual basis. Believe passionately that the essence of great teaching is not about presenting material or delivering information, it is about lighting a fire! Enjoyed hearing from Ann? See the full list of 2017 winners and read other interviews.